Renting a residential property is indeed one step closer to your independence, especially when you get to personally take the time and the effort to process and handle your paperwork like how a professional would. Though, there is no doubt that you can do it by yourself, it is still recommended to consult a legal counsel, or better yet, consider consulting a professional lawyer, since you will be dealing with important and confidential legal processes, which is no joke. 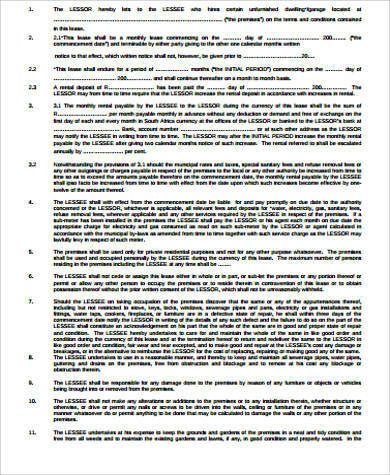 Furthermore, you can also check out this page’s Sample Agreements that you might find useful. 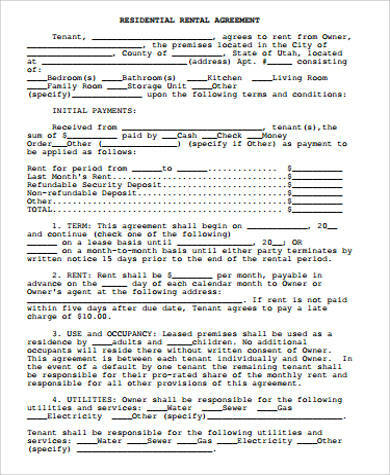 On any case and at any given time, you would have to do some research and, if possible, get familiar yourself with the paperwork processes involved when it comes to renting a new home. It may vary depending on where you live, but you can always check out our Sample House Rental Agreements as well as our Sample Room Rental Agreements for free, whichever you might find useful and helpful and would also suit your needs. 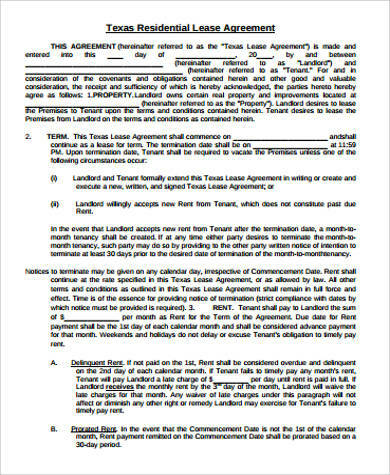 Tenancy for Years – this is the type of residential rental agreement that indicates and specifies the limited and definite term for the agreement. It could be one month, two months, or one year. 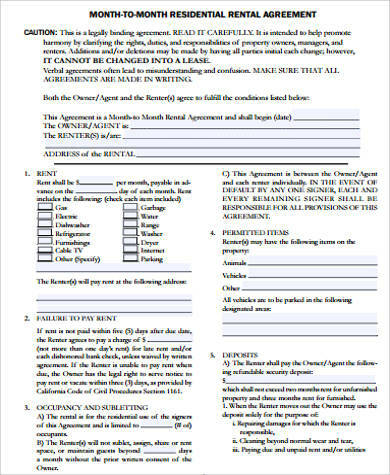 What makes this residential rental agreement much more convenient is that the residential agreement itself can automatically terminate at a particular date without any notice at all by either both of the landowner or the tenant. 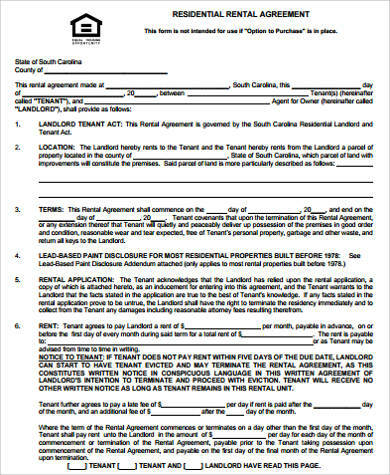 Tenancy from Period to Period – this type of residential rental agreement could be from year to year, month to month, or week to week. According to Investopedia, this is also renewable at a given period of time unless if it is opposed or terminated by the landowner or the tenant. 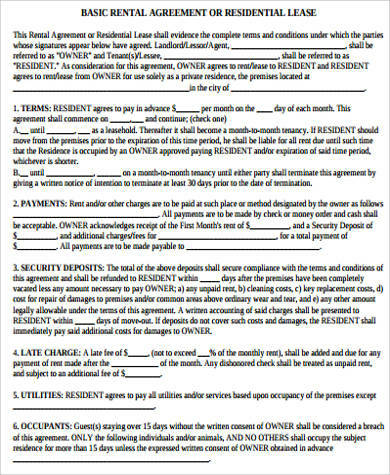 This type of residential rental agreement also indicates the period of time. 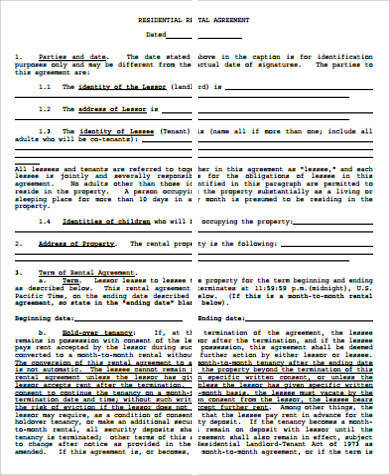 Tenancy at Will – in this type of residential rental agreement, the certain agreement is enforced unless either one of the landowner or the tenant would terminate the agreement, which makes this type of residential rental agreement probably the most pleasurable for both the landowner or for the landlord and the tenant. Though, it may sound as simple and as easy as that, but most often than not, the landowners would usually give enough time allowance for the tenants to vacate. 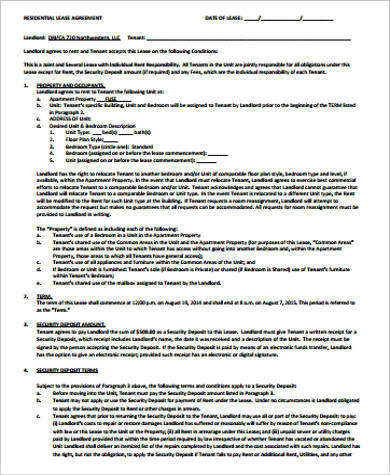 Tenancy at Sufferance – this type of residential rental agreement is typically a result of circumstances. The tenancy at sufferance was never to exist to begin with. According to Investopedia, this type of agreement would occur when a tenant would still remain on the property after there was a lease even if the lease agreement has already been expired or nullified. Moreover, you can also consider checking out this page’s examples of Simple Rental Agreements for free that you may find useful and helpful in the future for reference as you go along your journey. Apart from this, it is also recommended for both the tenant and the landowners to maintain and have a great relationship with each other at a professional level.